Marcum’s Hot Streak Continues; Warner, Owens, Cullen Get Victories - Anderson, Indiana Speedway - Home to the World's Fastest High-Banked Quarter Mile Oval! 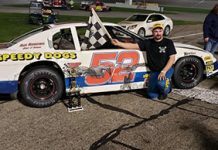 Morristown driver Jeff Marcum captured his fifth Late Model feature win at Anderson Speedway but Lady Luck had a big hand in the victory. Marcum set fast time during qualifications but would start sixth in the feature on Saturday following the inversion. Anderson’s Dustin Burge jumped into the early lead, just as he had done a week before, chased by Joe Woodring, Ronnie Rose, Kent Baledge and Danny Trent. After 15 circuits Burge had built up a comfortable lead while Rose, Trent, Marcum and Woodring battled for the second spot. For the first time in 2018 the caution flag waved during a McGunegill Engine Performance Late Model feature much to the dismay of Burge on lap 21 when Woodring came to a stop on the front straight pit area with the driver’s side facing the on-coming cars. Rose took the lead on the restart with an outside pass of Burge entering turn one with Marcum also making the pass on the former leader. Marcum dogged Rose’s tire tracks for the next nine laps and finally was able to make the pass with an inside move on the front straight. Rose came home in second followed by Baledge, Trent and Burge. 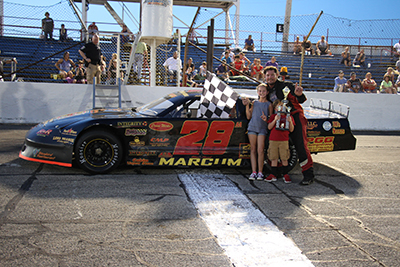 In Thunder Car action Anderson’s Nick Warner became the third different feature winner through the first five races of 2018. Warner started on the outside of the front row after fast qualifier Rose set the field with an inversion of six for the feature race. Warner took the early lead from Ron Phipps and was chased by Earl Adams II. The caution flag waved on lap 16 when Adams spun on the back straight after slight contact from Rose. Warner continued to lead chased by Jerry Swinford Jr., Rose and Adams when the caution flag waved on lap 23 for a spin by Tyler DeHart on the front straight. With Warner continuing to lead Rose and Adams passed Swinford on the restart and they kept pressure on the leader. At the checkers it was Warner, Adams, DeHart, Rose and Swinford. For 12 laps Shawn Cullen chased leader Curtis Chapman in the Hart’s Auto Figure 8 race, but took over the lead when Chapman’s ride developed a mechanical problem. Cullen was followed to the finish line by Warner and fast qualifier Jared Keller. Randy Owen remained perfect in Marcum Welding Front Wheel Drive action but had to retake the lead from Tim Page following a restart on lap 20. Devin Lane would come home in third. Pendleton’s Johnny Ginder won the Midwest Champ Cars feature.